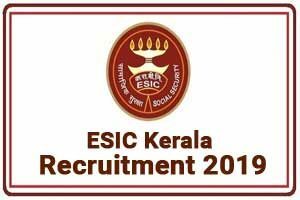 ESIC Kerala (Employees State Insurance Corporation Recruitment 2019) has taken out the official Notification, it has released a total of 64 official posts for ESIC Kerala Stenographer and ESIC Kerala UDC Job 2019. The application link is now active. Candidates who have been eagerly waiting since a very long time can go to the official website and apply now! ESIC Kerala (Employees State Insurance Corporation) is looking for very motivated and enthusiastic candidates to join them. Those candidates who are eligible and looking for career growth and an excellent opportunity to nurture their soft skills can apply. Total Vacancies: Tentatively 64 in total. A., The candidate should have the 12th standard degree from a recognized university, board or institution. The candidate should have a working knowledge of the computer which included the use of office suites and databases. Candidate should have the 12th standard degree from a recognized university, board or institution. 5. If ESIC Kerala (Employees State Insurance CorporationRecruitment 2019) receives a large pool of applications, then only those candidates who have been shortlisted on the basis of qualification, experience in the relevant fields shall be considered for the post. 7. The post is for Kerala Hence, only those candidates shall apply who are flexible in serving in Kerala.